Performed with common objects found in a pocket or at a desk, this trick is a quick, neat effect that can be done anywhere. The magician picks up two paper clips and some paper money. Holding the note up he begins to talk about a famous stage trick called the Linking Rings and says he has a smaller version of the same trick. Folding the note he then clips the folds with one paper clip and then folds it again. Clipping it with a second paper clip, the magician explains he is going to link the two clips before the eyes of the audience without touching them at all. Grabbing both ends of the note the magician snaps it open and the clips fly off, linked together. The secret to the Linking Paper Clips is knowing how to fold the note and where to put the clips. Two paper clips and a £5 or £10 note. The magician produces a note, or even better, borrows one from the audience. Producing two paper clips, he allows all three items to be inspected by any interested parties and then announces he is going to link the clips together without actually linking them together. Holding the note lengthways, the magician folds a third over to the right, towards his body. 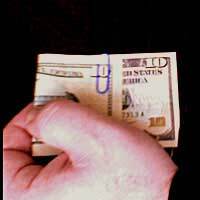 He then places a paper clip over the fold, pushing it down so that it snug up against the top edge of the note and over near the edge of the folded portion. The note is then turned around so that the fold is facing the audience. The magician should be careful not to turn the note over upside down - just turned around, so the clip is still at the top. The left end of the note is now folded over to the right, again towards the magician. The second clip is placed over the fold, towards the right edge. The key here is not to clip all three folds, just the two closest to you. Gripping both edges of the note firmly in the fingers and thumbs of both hands, the magician begins to pull and the clips begin to slide towards each other. As the clips begin to overlap, he snaps the note open and they link and pop off, sailing through the air. Try to be aware of where the clips will fly off once you snap the note open. Having them disappear into the audience will ruin the effect, naturally. Also, the timing of when to snap the note should be practiced.